At the very least, the Laos hoodoo has been broken; albeit, the 2-nil scoreline was a fair enough indication of how laboured the victory was for a Philippine national football team trying to edge forward to a seat in the semi-finals of the 2014 AFC Challenge Cup. Goals by Simone Rota and Patrick Reichelt in either half meant that the Philippines earned a first-ever full international win over Laos, the Azkals’ bogey team in Southeast Asia. In truth, Laos were so poor that all the Philippine outfield players could have sat down with a cup of latte and watched the evening edition of TV Patrol for news back home and the Laotians still would not have troubled Roland Müller in the Philippine goal. But Turkmenistan threw down the gauntlet with a resounding 5-1 victory over the same team on opening day; and thus earned precious advantage should everything come down to goal difference. The Afghans’ victory not only propelled them top of the group table but also nullified the Turkmen’s advantage in goal difference. With Laos eliminated, seats in the semi-finals are to be contested on Saturday between the Philippines, Turkmenistan and Afghanistan. The onus, therefore, was on the Philippines to hunt for goals. Yet, for all the team’s territorial dominance over the Indochinese team, one rather wondered where the first goal was going to come from. Juani Guirado twice had chances in the first half to use his height over the diminutive Laotian defence, one header from a corner thumping against the bar as early as the 9th minute. Perhaps the floodgates could have opened had he scored. Instead, for most of the first half, the Filipinos did not appear at all like they were on the same page. Rudimentary passes were being given away with alarming regularity and poor off-the-ball movement made it easy for the Laotians to close down spaces. So disjointed was the Philippine performance that one also wondered if, perhaps, the players could have been supplied with lanyards so that they could all have played wearing their ID cards. They did not seem like they had been properly introduced to each other. The Laotians lacked the physicality to challenge the Philippines in midfield, which meant that the Filipinos saw more of the ball. What they did with it, particularly in the attacking third of the pitch, was where the ID cards would have been of use. Sorely missing from the starting line-up was a player called Creativity. It just had to be, in a first-half of utter peril to the fingernails of those who follow the fortunes of the Azkals, that the first goal when it came made all the anxiety well worth the suffer. Stephan Schröck wriggled past defenders inside the box as the first half drew to a close, but his shot could only be stabbed out by a desperate Laotian foot. Rota, who had scampered forward to join the attack, pounced on the poor clearance with a thunderous strike that would have humbled even some of the world’s more renowned strikers. The goal was just reward for Rota, who has been among the team’s most consistent performers since Thomas Dooley gave him his first cap in Malaysia in March. Laos continued to offer little going forward in the second half, so that young Amani Aguinaldo, sent in for the injured Guirado, was only made to work once. Even then, the ensuing shot was so wide it probably annoyed the ball boy more than it did Aguinaldo. 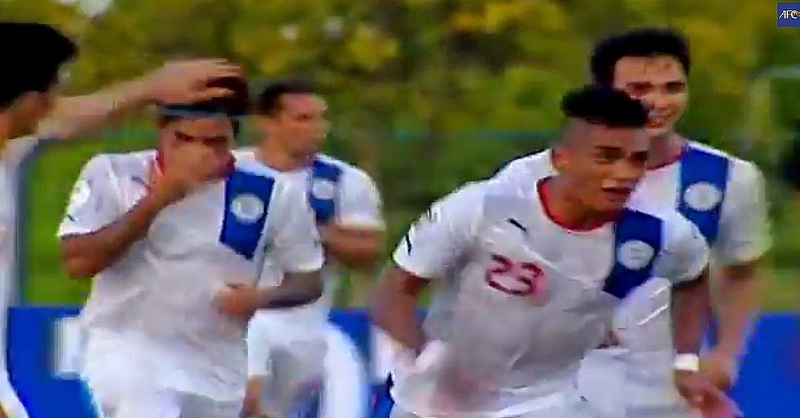 The second Philippine goal finally came after more huffing and puffing in the 62nd minute. From off a corner won by the off-form Phil Younghusband, Reichelt leapt above the Laos defence to nod the ball past the diving goalkeeper. The goal carried the feel of a not nearly enough; but its significance in the right perspective came after Afghanistan’s 3-1 victory over Turkmenistan in the second group match of the night.